Homeownership rates are on the decline for all age groups across the country, data from the U.S. Census Bureau shows. This trend is particularly pronounced for millennials, whose homeownership rates dropped from 42% in 2006 to 35% in 2015. With house prices back on the rise, sky-high rents and student loan debt, it’s not surprising that young adults today are struggling to buy their own homes. However in some American cities, millennials are bucking the trend and buying rather than renting. Below we comb through the data to find out where are millennials buying homes. In order to rank the places where millennials are buying homes, we looked at homeownership rates among households where the head of the household was less than 35 years old. We gathered data on the percentage of those households who owned their homes in 2006 and in 2015 for 200 of the largest cities. We then ranked the 200 cities according to the under-35 homeownership rate in 2015 and the change in the under-35 homeownership rate between 2006 and 2015. We averaged those rankings, giving equal weighting to both factors. We then assigned a score based on the final average ranking. The city with the highest ranking received a score of 100 and the city with the lowest ranking received a score of 0. The data came from the U.S. Census Bureau’s 2015 and 2006 1-Year American Community Surveys. This is the second annual edition of this study. Read the 2016 version of Where Are Millennials Buying Homes? here. Wide variances – In some cities, homeownership rates for millennials are actually quite high. For example, in Elk Grove, California, the homeownership rate for millennials was 60% in 2015. That number can drop as low as 11% in places like Orlando, Florida or Cleveland, Ohio. Northeast not so much – Only one Northeast city – Springfield, Massachusetts – cracked our top 25. The Northeast contains some of the worst cities on our list for millennial homeownership. In New Haven, Connecticut, for example, only 5% of millennials own their homes. Sacramento satellite cities – Two smaller cities in the Sacramento metropolitan area, Elk Grove and Roseville, are in the top 5 places where millennials are buying homes. Perhaps attributable to the strong STEM job market in Sacramento, the area is one of the best in the country for millennial homeownership. Find out how much house you can afford. The largest city in South Dakota ranks first in this year’s study of where millennials are buying homes. 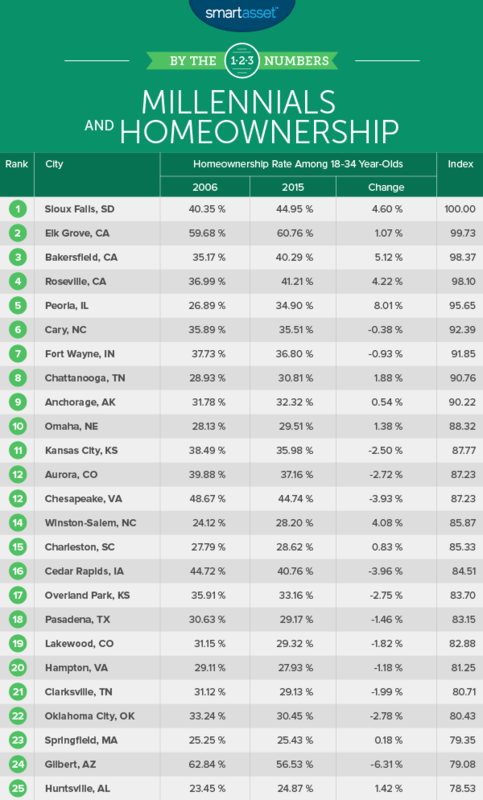 From 2006 to 2015, Sioux Falls saw homeownership among young adults rise from 40.4% to 45%. For millennials thinking about starting a family, Sioux Falls may be one of the best places to lay down roots. Our previous research has shown that Sioux Falls is one of the best places for children, with a particularly impressive educational record. For a long time, Elk Grove was a small agricultural city. Since 2000, however, the population has increased by over 100,000, with many people attracted to Elk Grove’s relative affordability and proximity to jobs in Sacramento and San Francisco. The median value of a home in Elk Grove is $350,300. That’s not bad compared to San Francisco’s $941,400. Elk Grove had the highest rate of millennial homeownership in 2015 in our study at 60.8%. Bakersfield, the ninth-largest city in California, is located in the San Joaquin Valley. Under-35 homeownership in Bakersfield increased from 35.2% in 2006 to 40.3% in 2015. That’s an increase of 5.1%, the second-largest in our study. For a somewhat large city, homes here can be relatively affordable. The median home value is $237,600. Located about 20 miles from Sacramento, this city is a good place for millennials looking to buy a home. Roseville had the 13th-highest rate of under-35 homeownership in 2015 at 41%. This was up 4.2% from 2006, the fifth-largest increase in our study. Check out current mortgage rates in California. 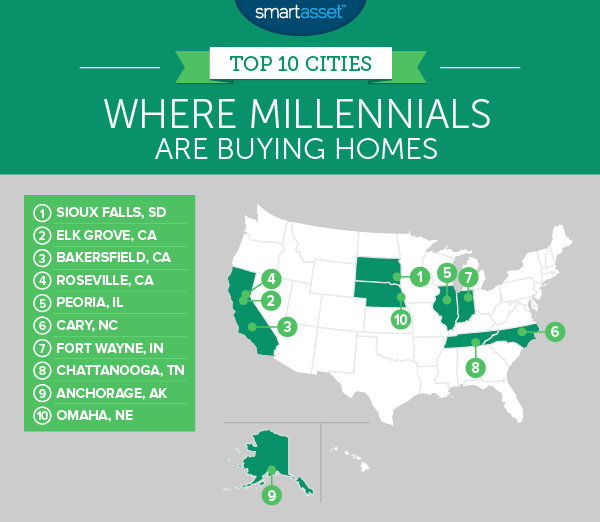 Peoria, Illinois takes fifth place in our ranking of where millennials are buying homes. In 2006, 26.9% of young adults in Peoria owned their homes. In 2015 that number jumped 8%, the highest increase in the study, to 34.9%. Millennials are probably attracted to the affordable homes which can be bought here. The median home value is $132,000, the second-lowest in our top 10. Cary, North Carolina recently ranked as one of our best cities of 2016, due to its safety and booming economy. Those two factors may partially explain why millennials are buying homes here. Cary’s homeownership rate among young adults fell a bit from 35.9% in 2006 to 35.5% in 2015. Despite this slight decline, Cary made our list because a 35.5% millennial homeownership rate is still quite high. Fort Wayne maintained its high rate of young adult homeownership between 2006 and 2015. The rate dipped 0.9% from 37.7% to 36.8% over that time. Like Cary, the small decrease in millennial homeownership may sound counterintuitive until you consider the entire country. Overall 179 cities in our study saw millennial homeownership rates decrease more than 0.9% over that time period. Fort Wayne also has the most affordable homes in the top 10. The median home value is $105,900. Chattanooga is one of the few cities in which under-35 homeownership rose from 2006-2015. In 2015, 30.8% of millennials in Chattanooga owned their homes. That is the 38th-highest rate in the country and is a 1.9% increase on 2006’s figure of 28.9%. That 1.9% increase was the seventh-largest in our study. Anchorage millennials may be some of the most financially savvy. Despite the city having one of the highest median home values at $302,500, millennial homeownership in 2015 was up 0.5% from 2006. These new homeowners appear to have made a fairly sound investment as Anchorage house values are up 5% over the past year, according to Census Bureau data. Omaha rounds out our study of where millennials are buying homes. Omaha is the largest city in our top 10 and like other large cities, the number of homeowners is relatively low. In 2015, 29.5% of millennials in Omaha owned their own homes. That number is a jump from 28.1% of under 35s owning their homes in 2006. In fact, it’s the 10th-largest increase in our study.